Sonnenberg Station began in Spring, 2006 with a simple goal--a few men gathering to sing songs of faith and everyday life. From churches and businesses, to universities and concert halls, Sonnenberg Station men's choral ensemble has performed in more than 30 different venues to appreciative audiences throughout Ohio. Their repertoire features beloved classical pieces as well as contemporary selections and everything in between, several from original arrangements written by the group's director, Tim Shue. Each season’s selections draw from traditional spirituals, fun folk tunes, and always include a few lighthearted surprises, all covering a variety of cultures, eras, and styles. The Singers of Sonnenberg Station by Julian. "Sonnenberg in Wayne County, Ohio, never had a post office nor even a village by that name. The nearest thing to it was the Sonnenberg store at what formerly was known as Sonnenberg Station, now Kidron Station, along Road 98 at Sugar Creek. For years this served as one of several country stores of the community as well as a shipping point for freight and a passenger station for the Wheeling and Lake Erie Railroad, now the Norfolk and Western, which runs through the Sugar Creek Valley." ~From the book Sonnenberg: Haven and Heritage. Choral music, as most of Sonnenberg Station's members have experienced it, is not an elitist activity reserved for highbrow concert halls in major metropolitan cities. Instead, it was something many of their ancestors, who lived and worked in rural areas, routinely practiced during daily life. Singing was an artistic expression everyone, from the smallest child to the most wizened grandfather, could participate in and enjoy. 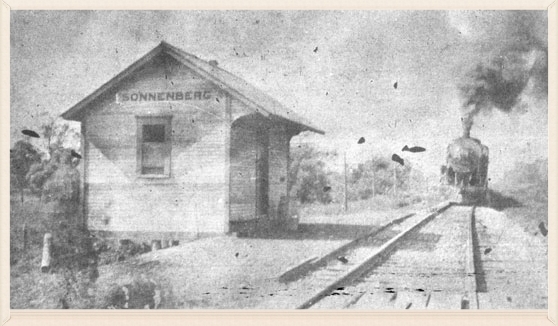 Sonnenberg Station, a rural Ohio train depot, was a physical, tangible place near the church, Sonnenberg Mennonite, where the ensemble rehearsed for several years. That depot was a reminder of the groups's foundation in this community. Singing is a spiritual, emotional reminder of familial and geographic rootedness, too. When the ensemble formed, they decided to show their appreciation for the historical connection they had with that place called Sonnenberg Station and the surrounding region where many of the singers grew up. And though director Tim Shue called Kansas his childhood home, his mother's family originated right here in Kidron's Sonnenberg Valley. "Many choral groups have fancy Latin names," says Shue, "but I like to think that the image of a simple train station means choral music is also very earthy and organic and within most people's ability to relate. Also," he adds, "it just sounds really good!"